How quickly things change. Just like the Madden Curse, the Mountain Times curse is real. Just ask Killington Resort. The Madden Curse affects football players and the Mountain Times curse is for softball teams. 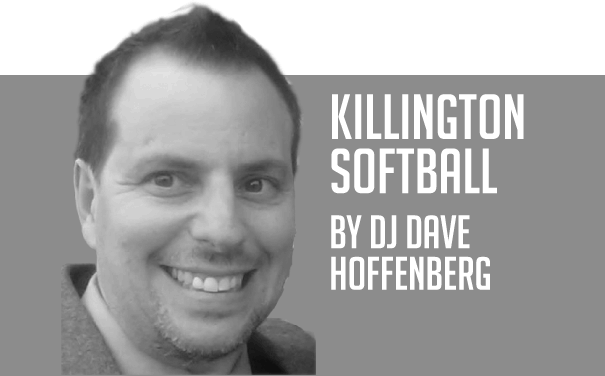 Last week the article headline read, “Killington is back on top.” They were until play resumed and then they lost their next two games. One was their second loss in a row to the OmyaRamas and the other was their first forfeit in team history. Curses are real. The OmyaRamas had a near perfect week but just like in the last round, after they beat KR they lost to Clearly Moguls. More on that later on. They started the week with a double-header against McGraths Sushi and then KR. Both games they were the away team and had to stave off last inning comebacks. OR led off the MS game with a “Cold Milk K” suffered by Dalton. They quickly got two outs but were able to knock in three runs. “Bus” Bob Schaffner scored in the bottom of the first to cut the lead 3-1. The second inning saw more “CMKs” by OR. This time one apiece by Ben Davine and “Coach” Bailey Peters. They were able to tack on two more runs. The same could not be said for MS as they got no hits and no runs to keep it 5-1 but they were able to do the same to OR in the third. MS used that momentum and tied the game in the bottom with three coming off a home run by “Big” Josh Tarleton. They had a chance for more but Jeremy “Higher” Prior ended the inning on a “Cold Beer K.” Davine led off the fourth with a “CMK” but his team went on a little hit parade, scoring four runs to take a 9-5 lead and then had some sweet “D” and shut down MS, 1-2-3. OR had nothing doing in the fifth, but MS scored three to cut the deficit to one. Peters suffered his second “CMK” of the game in the top of the sixth but his team scored two runs to go back up three. MS produced a run with a two-out rally in the bottom to come within 11-9. OR could not get any insurance runs so they have to hold off MS in the bottom of the seventh. Tarleton got on base but two of his teammates flew out so they need a two-out rally to win this. Prior knocked in Tarleton to bring them within one and then had runners on second and third. Unfortunately, Taylor Stone popped up to the first baseman to end the game with an 11-10 OR victory. OR immediately had to face KR and took a 1-0 lead in the top of the first, but KR quickly went ahead 2-1 in the bottom. OR was playing this game with only nine players which is a huge disadvantage in the outfield. One of those outfielders stepped up big. OR have some young, strong arms on the team and that was evident when KR’s Evan Anderson got gunned down at the plate from the right fielder to second to home. OR hit through their order in the second to take a big 7-2 lead. KR got two of those back in the bottom but Ian Smith ended the inning with a “CBK.” OR bats went cold in the third, but KR’s Matt Kinsman scored to cut the deficit to two. OR got that run back but stranded the bases loaded to end the inning. KR did nothing in the bottom to keep it 8-5. OR bats went cold the next three innings as they could only get two hits and not add to their lead. KR got quite a few hits in the fifth but could only get one run and stranded the bases loaded, and then in the sixth they went down 1-2-3. On to the bottom of the seventh we go with OR clinging to a two-run lead, again. KR got their first two batters on and then Pat went down with a big “CBK” looking for the first out. They quickly got out number two, but then Smith and Justin Guth knocked in a run apiece to tie it 8-8. Guth got stranded at third after Kinsman flew out. The league has it’s first extra innings game of the season. OR went down 1-2-3 and KR put the winning run on base but failed to get him in. After four innings without scoring, OR finally woke up their bats and put three big runs on the board in the ninth for an 11-8 lead. With their backs against the wall, KR had to dig deep. The bottom of the ninth started great as they scored two runs to cut the deficit to one. Next they put runners on the corners with one out so a fly ball could tie this game and possibly win it if they added a hit. Unfortunately for them, Smith hit into an inning- and game-ending double-play and OR secured their second 11-10 win of the night. Clearly Moguls also had a double-header that night and regained first place after their double-header win. First up was First Stop Outback. CM started their scoring with a two-out rally right off the bat, scoring seven runs. Three of those were off a bases clearing triple by Hunter “Make Your Mark” Pike. FSO answered back with four runs and a “CBK” by Sam Budusky. There was nothing doing in the second for either team except a long over the fence home run by Brett “No HR for You” Regimbald that ended up being an out because FSO noticed a lineup error and had it recalled because they couldn’t afford to let it stand. Regimbald had a nice web gem in the bottom to keep the score 7-4. CM welcomed back Jeremy “Jackie Blue” Livesey from the DL for his first game of the season and he delivered a RBI single. Jesse Mike Pelland added a two-run single to stretch the lead to 10-4 good buddy. Pitcher Johnny Sharpe was able to deliver a rare “CBK” to Angel Shannon. Wyatt Mosher jacked a two-run shot to cut the lead 10-6 but Tyler “Faceplant” Lysakowski joined Budusky in the “CBK” department. The bottom of the order produced for CM with “DJ” Dave Hoffenberg, Russell “Shitake” Dalglish and Regimbald all getting singles and scoring and then Judd Washburn added three more with a blast over the fence to give CM a 16-6 lead. FSO got one back in the fourth and Collin Wolfe joined the “CBK” team. CM couldn’t add any in the fifth and saw Dalglish go down with a “CBK.” Mosher drove in a run and Lysakowski had a nice looking sac to creep within seven runs, 16-9. The bats quieted for CM for the rest of the game and Pike went down looking for a huge “CBK” in the seventh. It didn’t really matter because FSO went down 1-2-3 in the sixth with a huge out on Sharpe by “Ronzoni” Hacker in what is being called the “Bait Gem” by Hacer and they could only get two runs in the seventh to fall 16-11. Next up, CM faced the Karrtel and they started the scoring with two in the first. The Karrtel maybe winless but the team is having a good time every game. It’s literally like a 300 lb. rock that was dragging them down, has been lifted off the team. CM answered with six runs, three off a “Tall” Tom Gilligan rocket to center field. The Karrtel’s bats quieted the next few innings but CM heated theirs up. Regimbald scored “DJ” Dave and himself with an inside-the-park home run. They only scored with two close plays at home. “DJ” Dave slid under Luke Carey’s tag and while laying there, Regimbald tip toed around home plate. Forrest Baker delivered a “CBK” to Dalglish in that inning. CM added another five in the third to make it 13-2. The Karrtel got one in the fourth, but had some woes as well when Michael Smith hit into a double-play and Matt “Leaving Las Vegas” Thayer suffered a “CBK,” his first of the season in only his second at-bat. The Karrtel brought in Smith as a relief pitcher and moved Baker to the outfield in the bottom fifth. CM tagged him for five runs, two off a Shannon blast to right. He did send Gilligan back to the bench with a huge “CBK” looking. Gilligan doesn’t “CBK” much but when he does, it’s looking. The Karrtel put on their rally caps and hit through their order, scoring six runs to cut the lead 18-9 and stave off a mercy at the moment. The only blemish in that inning was Alexis King joined the “CBK” team. Unfortunately, CM got that mercy with five runs in the bottom fifth to win it 23-9. CM needed one more win to close out the second round in first place and they got it against OR. Washburn put CM up 2-0, but OR practically hit through their order in the bottom and took a 3-2 lead. They added one in the second to double up CM, 4-2. The third was huge for CM as they scored seven with four coming off a long bomb grand slam from Tucker Zink to take a 9-4 lead. CM welcomed back “Twelve Pack” Jack with a “CBK.” OR got one in the fourth to cut the lead to four. CM was a base hit machine in the fifth, adding four runs. Ronzoni played some great “D” in the bottom but then Joe “D” took him deep with a three-run shot. Shannon added a solo home run and that was all she wrote. OM suffered a 14-8 loss and still has yet to beat CM. The week ended with what seemed to be a walk in the park game for MS against the Karrtel as they jumped out to a 17-0 lead after three innings. Clearly Moguls vs Killington Resort @ Killington 5:50 p.m.
Killington Resort vs McGrath’s Sushi @ Killington 7 p.m.
First Stop Outback vs OmyaRamas @ Bridgewater 5:50 p.m.
First Stop Outback vs Karrtel @ Bridgewater 7 p.m.
Karrtel vs Clearly Moguls @ Killington 5:50 p.m.
First Stop Outback vs Clearly Moguls @ Killington 7 p.m.
OmyaRamas vs Killington Resort @ Bridgewater 5:50 p.m.
OmyaRamas vs McGrath’s Sushi @ Bridgewater 7 p.m.